Like many other bloggers I was contacted by Build A Sign some time ago with the offer to make some Custom Bumper Stickers for my blog. I loved the idea, but didn't really know where to start other than my logo. Megan was more than helpful to step me along in the process and help me ultimately get a great looking product. 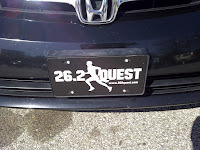 I had my logo, and I knew I wanted to use the tagline "Marathoner In Training" and reference my blog address, but that was about as far as I was. I did have it somewhat done since I had worked on this before, but it was the opposite given that I wanted it to be white on black to match my car. The finished product was absolutely awesome. I received some Custom Magnetic Signs that were made just like the bumper stickers (because I don't put stickers on my car), some Custom Bumper Stickers, and a Custom License Plate. Who doesn't love Running Bumper Stickers? I have some extras and if you will display it proudly just send me an email at info@262quest.com with your address and I will send what I have out. Please hurry as I don't have many left, and when they are gone they are gone. I am not sure when I will be getting more so make sure you get them while they are still available! What do you think? Do you like the design? If you were given the opportunity to make your own custom bumper sticker, what would it say? 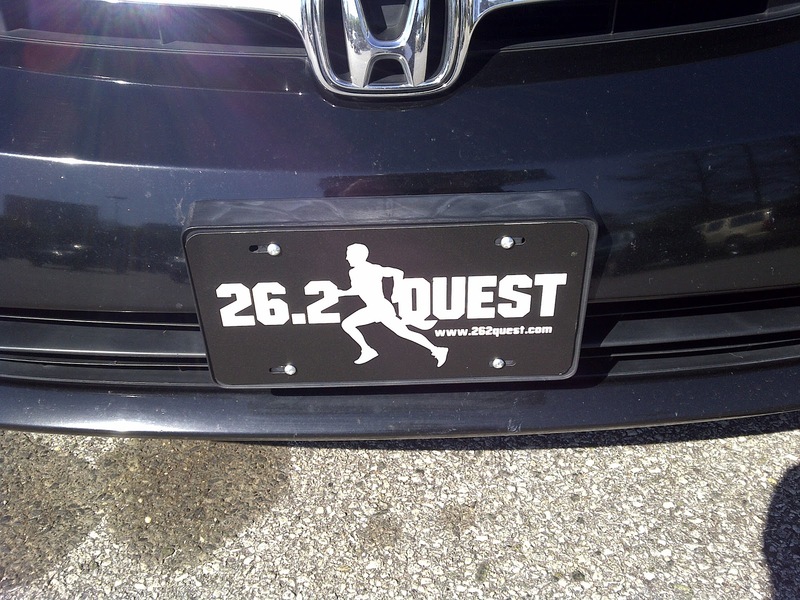 Why thank you 26.2 Quest. I wanted one so bad I drove all the way to Georgia to pick it up from you. It would have been cheaper for you to have mailed though, as I ate all your cheese, fruit, and whatever else lol!! Love it! They really look great!